Letting go of a relationship that we did (or still do) care about is a very difficult thing for us all. Whether it’s a significant other, friend, or family member, we naturally do not want to bring any hurt upon them or ourselves. There are times, however, where letting go of someone may be the best thing to do – even when it doesn’t feel good in the present. After all, this is your life…and only you can make the ultimate decision whether or not that person fits into it. 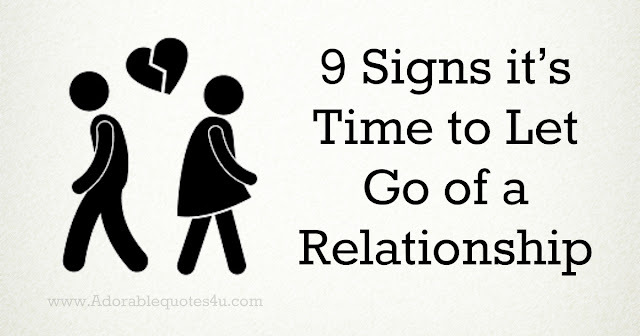 HERE ARE 9 SIGNS IT’S TIME TO LET GO AND MOVE ON. 1. THE PERSON UNREMITTINGLY BREAKS YOUR TRUST. There is a reason that trust is number one – because trust is the most important in each and every kind of relationship. Trust is the foundation upon which a relationship is built, and it is mistrust which often destroys it. Nothing weakens a relationship more than being deceitful. Something to understand – when you trust someone and they continuously break your trust, it’s not your fault it’s theirs. It’s very natural to immediately blame yourself for having trusted someone only to have them break that trust, but don’t. It’s only through experience where we determine whether or not someone is trustworthy; either way, you’ll learn a valuable lesson or add a great relationship. 2. THE PERSON IS INCESSANTLY NEEDY. A good relationship is one in which you can depend on someone or vice-versa. However, too much dependence is a sign of neediness. This is a problem because neediness drains you of your time and energy, including the time and energy necessary to maintain other relationships and take care of yourself. People that are incessantly needy always seem to be coming to you – for pampering, favors, money, praise, or something else. You may begin to feel that the person is an emotional ball and chain. If a relationship begins to feel this way, it may be time to reconsider why you have a relationship like this in the first place. 3. YOU CHANGE WHO YOU ARE AROUND THAT PERSON. You should never feel the need to be another person just to accommodate someone. It’s exhausting first of all, and it is a telltale sign that the relationship is not consensual. There is some element of that individual that does not jive with the person you are. Whether or not the person verbalizes their dissatisfaction with you or you innately know that you must change in order for them to accept you doesn’t matter. What matters is that you do not feel comfortable being yourself, which shouldn’t be acceptable to you under any circumstance. 4. YOU DON’T FEEL POSITIVE AFTER TALKING TO OR SEEING THEM. A positive relationship should mostly be uplifting. Sure, there are going to be some rough patches along the way, but it’s mostly a constructive experience. You should be accepting of each other, supportive and responsive. If you hit a point where the positive aspects of the relationship are sporadic, it may be time to move on. You may actually come to a point where you actually attempt to avoid the person, while hoping to maintain the relationship. This may sound crazy, but people do it all the time. “Maybe it’ll get better” they think to themselves. Perhaps, but then it’s not a normal, functioning, or healthy relationship. 5. THEY DON’T ACTIVELY LISTEN TO YOU. Attentiveness and awareness when you are speaking is the sign of a good relationship. A person that values your relationship will make your presence a priority, including when you’re trying to have a conversation. Sure, some people don’t have the best attention spans; but that’s no excuse for constantly checking their phone, looking away, talking to other people, and generally displaying apathy when you speak. It’s certainly not acceptable for them to constantly redirect the conversation back onto themselves, completely disregarding your thoughts and feelings. 6. THEY DON’T MAKE THE RELATIONSHIP A PRIORITY. Busyness is a part of life – work, kids, marriage, finances, etc.…the majority of our time is meticulously accounted for. However, people that value their relationships will not allow the fact that they are busy to undermine your relationship. Understandably, the get-togethers and all-nighters are drastically limited. However, with the advent of technology comes the ability to stay connected to each other, even if you cannot hang out at a bar until 2 a.m. anymore. If someone is not willing to make some time for you, be it a quick phone call or text, then they are effectively showing indifference – not a good trait to have in a positive relationship. 7. YOU ARE NOT ABLE TO DEPEND ON THEM. Have you ever been there when a friend needed it most, only to have them disappear when you asked them to reciprocate? If you have, it’s not a pleasant feeling…in fact it’s downright disheartening. People that are undependable often find an assortment of excuses – a missed call or text, that they’re “too busy”, or something else. However, consistent behavior of this kind usually means one thing: they are not dependable. Someone that is not dependable is generally not a person worthy of your presence. 8. YOU FIND YOURSELF FORCING SOMEONE TO CARE. Another fact about relationships: it’s based on freedom; the freedom to love and care for someone…or not. Not everyone whom you hold these feeling for will offer them in return. Genuine relationships are made up of two individuals that have chosen to love and care for each other. It’s easy for someone to show up in your life and tell you that they love you; it’s much more difficult for them to demonstrate that love consistently. Those that choose to remain in your life and steadily demonstrate their love and care with wholehearted acceptance are the type individuals that you want for your relationships. 9. THE PERSON IS NOT CONSISTENT IN THEIR BEHAVIOR. We are not talking about dependability here. We’re talking about wish-washy, flaky, and general inconsistency in applying the principles that make up a good relationship: trust, dependability, acceptance, positivity, attentiveness and prioritization. Inconsistent behavior in any of these areas is a potential sign of a negative relationship. As mentioned, only you can decide if the behavior merits a termination of the relationship. People are flawed. Flaws are natural; flaws are part of acceptance, in fact. However, it’s the degree to which a person acceptsthese flaws and continues to allow them to influence your relationship that truly matters.We encourage you to evaluate the overall health of the relationships that you hold and make the best decision for you. We wish you many healthy, wonderful relationships in the future.